Pine Tar is a traditional coating used on wood and metal. Pine Tar has been used for waterproofing the insides and outsides of boats for hundreds of years, dating at least as far back as the Vikings in the 9th century. Pine Tar is a classic preservative for wood and natural fiber rope. Pine Tar is also used for wood preservation on utility and fence poles and wood shingles. Pine Tar is a safe and effective substitute for pressure treated lumber. Genuine Pine Tar is also a topical antiseptic used by horsemen to combat fungicidal and bacterial infections in horse's hooves. Helps keep hooves elastic and flexible. Effective treatment for quarter cracks, split hooves and hard frogs. There are many recipes for 'boat soup' and homemade varnishes that include Pine Tar. Mix Pine Tar with Japan drier, boiled linseed oil, and turpentine in appropriate quantities and proportions for a traditional varnish. See the recipe shown below. Used on wooden decks for schooners, fishing boats, and porch decks. Makes for an amber finish. To customize the mixture, add more pine tar for a darker color or add less for a lighter color. Allow more drying time for the darker mixture. * Covers approximately 100 square feet. I have a tree with a hollowed out hole in it. A nursery told me to fill it with pine tar. Will this Bickmore pine tar do the trick? I noticed some people said it was runny. I need something that won't run out the hole. Yes, it is runny...all Pine Tar is. You don't need to FILL the whole...justcoat it super heavy/thoroughly. Pour it into every crevasse of the hole.Repeat twice a year, OR add some black oil based paint to the mixture (2Tablespoons per 4 oz tar) and coat it every two years. 1. Is it creosote free? Is it suitable to make pine tar soap? As I live in Hong Kong, can Pine tar oil be delivered to Hong Kong? You'd have to ask customer service at Jamestown Distributors about that. I do not work for them...I'm just a customer that has purchased the Pine Tar in the past. 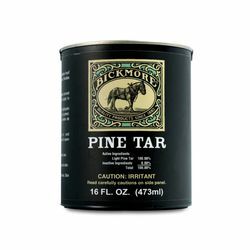 My experience with Bickmore's Pine Tar is that it is a natural product derived from pine resins. As advertised on the can it contains 100% pine tar resin. Jamestown's website does advise to add petroleum products to the product creates a more suitable for application to wooden boats. This is to overcome the natural pine tar's tendency to retain viscous for long periods of time. You may also wish to read the MSDS (Material Safety Data Sheet)of which you will find a link on JamestownÂ’Â¢? ?s Pine Tar product web page. Will pine tar stop sap dripping from large limb futon pine tree? Pine tar is most effective when applied in thin coats with a disposable brush. Wait a day and ad another if you think you need it put one coat has done it for me. Yes, it will eventually harden and stop dripping. I looked on the internet for uses and saw nothing about that. The closest I found was its use on horse hooves. I got it to use as a base on wooden cross country skis. I realize this is of no use to you. As pine tar is mainly used in large wooden boat bilges, I really do not think that it will do anything to help the above situation. Can you paint over a surface treated with a half & half mixture of pine tar & raw linseed oil? I would like to treat my 150 yr old barn, all ancient and grey barn wood, with the above mixture, but then I will also want to paint it red to match the other barns in this area. I think that the pine tar would prevent paint from properly adhering to the wood. p.s. I would be painting with linseed oil paint over the pine tar? My boat is finished with a 50/50 mixture of pine tar and tung oil. I would think linseed oil would be equally compatible with pine tar. The one thing to watch out for is that pine tar does not really &quot;cure&quot; unless it get's direct sunlight. I don't know what your full question was but I imagine you want to know if you can use a linseed oil based paint over Pine Tar. I haven't personally done so but I can't see why you can't. The Pine Tar I used was mixed with Linseed Oil before I applied it to the decking and they are clearly compatible. Sheridan, I was asked to answer this because I bought a can of pine tar from Jamestown several years ago. I got it to use on the soles of my wooden cross country skis. Painted on and burned in with a torch and then wiped off it makes a good protective base wax will stick to. I've never tried to paint over it. I presume linseed oil might stick to it, or more likely soak in with it. I've used boiled linseed oil on a rifle stock with a good result. Before taking any advice I'd try it on scrap wood and see for myself. On reading this, I realize it is likely of no help to you. I'll send it anyway. We used the pine tar on the keel scarfs as we rebuild an old oyster dragger circa 1925. It was liberally applied to the ends of the white oak frames where they attached to the keel. This was easily done in the early stage where you could actually walk between the frames. I also believe they used it putting together the stem. Come to Oyster Bay, LI and see our progress. Wish I could help, I use it for topical use in a salve. My thoughts would be that the surface of the pine tar might not hold up well to the paint? Are you staining the canvas with the pine tar first? then wiping it off? does this pine tar have creosote in it???? @Harriet, no. Pine tar is a natural derivative of pine trees. is your pine tar creosote free? The label shows pine tar only. The smell is not as pine scented as other pine tars I use for X country ski bases for example. There is no creosote in the pine tar. I use it on decks when mixed with other ingredients and there is no harm walking barefoot. Totally safe. I cannot locate my can of leftover Brickmoore Pine Tar, so am unable to check the label; however, I remember the stuff emitted a strong odor resembling Creosote-treated railroad ties. Does this pine tar state on the label that it does not contain creasote? No it doesn't state that. I would consider pine tar to be very similar to creosote though (positive and negative). Creosote is made by the distallation of tar. If pine tar were distilled, one of the products would be creosote. There are two types of creosote, wood creosote and coal creosote. I am assuming that you are worried about the carcinogenic properties of coal tar creosote. Not sure..I bought it about two years ago and used it all up.. The label does not state the absence of creosote. The only ingredient listed is Pine Tar.We have used this product as a wood preservative ingredient for 10 years to protect wood items in our garden. We have never observed a problem with Pine Tar and our plantings. The definition of Pine Tar is the same as that of creosote: Pine Distillate. Our wood preservative recipe is the same mixture used historically by the British Royal Navy. Our Climate, New Mexico, is extremely harsh on wood. Very little Pine Tar is used but still our recipe works extremely well whereas the alternatives are far more questionable. We feel that the amount of pine distillates in the recipe is not meaningfully different than that found in wood mulch.The recipe given on the Jamestown website is equivalent to the British Navy recipe used for wooden ships. Use less pine tar for a lighter color. Buff with sandpaper before all coats; The value of this recipe is in it's excellent penetration qualities. Always do more than two coats and allow to dry completely between coats. I teach printmaking at Weber State University and used this as part of an etching ground. I am sure this is not a typical use for your product, but there it is! Patrick M, this will do the trick. Mix up a batch of high-strength &quot;boat soup,&quot; two-parts pine tar, one-part turpentine, one-part raw linseed oil, with a dash of japan drier. Coat the inside of your boxes liberally and put in a sheltered place in the shop or garage to dry for a couple of days. Re-coat as needed. Allow to dry sufficiently so the coating won't abrade with the soil or a stray stone. I won't vouch for a soft-wood like SPF, but this should hold up for a while with harder woods. Pine tar would work, but creosote might be better. I cannot say for certain, but wood pitch was used to preserve the wood of Norway's medieval stave churches for hundreds of years. So, I think it's worth a try. This tar is not black like the tar used in street repair. I haven't personally used it for waterproofing. Patrick, I used the PINE TAR on the back of a bench that was exposed to a damp dirt situation. I found that after several days of letting it stand before installing the bench the Pine Tar was not dry. I don't know if it ever dried after the bench was installed. I don't know if putting it on the inside of a planter would be wise not knowing how the plants would react to it but on the outside should keep water from seeping into the wood. If it doesn't dry as I found I'd be careful where I sit the planters. I will be using it on some treated posts as extra protection when I put them into the ground to help keep water from being drawn into the post and hopefully making the posts last much longer. I hope this answer helps. Yes, however you must apply it to all hidden surfaces and outside as well as inside box, before assembly. Then very important to let it bake in the sun for a day, this lets all aromatics evaporate so as to make a healthier planter for your desired plants. Do not thin the pine tar with anything other than real turpentine. Mineral spirits and other paint thinners leave contaminants. Is the can resealable. If not, what about pouring it into a mason jar and sealing the rest that way? The 1 gallon can is essentially a paint can with a resealable lid. As I recall, the can is resealable, just like a paint can. A mason jar lid would get too gooey, so I would rule that out. It's just a paint can, but the stuff doesn't evaporate or set up anyway. grrrrrreat stuff but a bit sticky. Great product just as described. Good consistency and makes great soap. Takes a litte work to clean up. I will purchase again. Great product for homemade varnish to waterproof decks. Has an excellent consistency for mixing with boiled linseed oil. Note, paint thinner works just as well as turpentine and dries just a tad faster. Wikipedia says that pine tar was used to treat wooden skis in the past. I treated them a couple weeks ago, so I guess I'd say that is the recent past. I went skiing and had fun, so I'd say the product met my expectations. I use it in wood boats and I just smelled it and it dosn't smell like the pine tar I get from other sources. runny also. maybe this shoud be stuck with horses feet like the lable says. It need to serve its purpuse and smell good too. Pine Tar is a great product to add a nice brown color to natural wood and protect the wood from the elements. The problem I have with Bickmore Pine Tar is the smell. Stockholm pine tar has a nice pine odor. Bickmore has a very strong smell that is anything but the smell of pine. So be prepared to air out the garage after using it. Whatever you do don't try to paint over a wood surface that has been coated with pine tar. The paint will not dry properly. That also goes for varnish. North East weather is hard on porch floors. The summer sun can UV/bake the best finish. Fall rains can soak the floor repeatedly. Slushy wet snow can lay on it for days. Pre-painted mahoghany is just not up to the task. And I can't afford the plastics. What to do?I looked at Jamestown's traditional coating recipe and some others. The consensus out there seems to be for repeated "soaker" coats followed by a "finish" coat.I took two Jamestown one-quart plastic containers with lids. In one, I put 10 oz Raw Linseed Oil, 10 oz Pure Gum Turpentine and 4 oz Pine Tar, for a "soaker" batch. In the other, I put 10 oz Boiled Linseed Oil, 10 oz Pure Gum Turpentine and 4 oz Pine Tar, and a dash of Japan Drier, for a "finishing" batch.The "finish" was applied to the tops of the treated joists, open grain of the decking on the house side and the bottom of the flooring. The "soaker" batch was applied repeatedly to the flooring tongue and groove, and to the top surface and open end grain. After the walking surface looked dry - some time later - I'd hit it again with the soaker. After rejection, that is, no more soaker coat being absorbed, I finished it. Caution: follow up with a soaker coat on a periodic basis, especially on the end grain. This will give one a dark porch floor over time. But it will be as weatherly as a frigate's squared yards.